Lo staff che supporterà gli azzurri nel corso della trasferta in Cina sarà composto da Francesco Fissore (Performance Manager), Katia Filipponi (Fisioterapista) e Fabio Rastelli (Performance Analyst). Sabato, si gareggia su distanza olimpica nella notte italiana: per il nuoto, previsti 2 giri da 750 metri, 6 tornate da 6.7 km per la frazione di ciclismo e 4 giri da 2.5 km per la terza frazione. Risultano iscritti 60 uomini e 44 donne. The city of Weihai in the north-eastern corner of China will be the setting for the 12th stop of the 2018 World Cup season this weekend and, coming just a week after the WTS Grand Final on Australia’s Gold Coast, both the men’s and women’s races are filled with big-name talent. The athletes will tackle a challenging standard-distance course that begins with two laps in the waters of Halfmoon Bay before a six-lap ride that includes an energy-sapping 2km climb, rounding off with four loops of a fast and flat 2.5km coastal run course. Wearing the number one on Saturday will be USA’s Taylor Spivey, fresh from her solid 7th place on the Gold Coast. Having posted no fewer than six top ten WTS finishes this season and following her second place in Miyazaki last year and again in Cagliari just over three months ago, the American will be eager to deliver her first World Cup gold on Saturday. Lisa Perterer was the champion in that memorable race in Sardinia and, despite not quite hitting those heights since, she will know that she has the potential to take control of the race if the Austrian can get her tactics right on the bike. Standing in their way is a field rich in quality, however, not least Japan’s Yuko Takahashi, fresh from her Asian Games title, and the ever-present threat of Ai Ueda. The Belgian duo of Claire Michel and Valerie Barthelemy could also be potent challengers after strong showings in the WTS Grand Final, Michel no stranger to the World Cup podium where she would love to return for the first time since New Plymouth back in March. Czech Republic’s Vendula Frintova rose to the occasion in Karlovy Vary to record a hard-earned gold on home turf a month ago, and Estonia’s Kaidi Kivioja will be looking to follow up her excellent second place after Frintova edged a thrilling finale to that race. Also hoping to recreate a little Karlovy Vary magic will be Italy’s Annamaria Mazzetti, who’s third place marked a stunning return to World Cup racing and a first podium in five years. Leading the line in the men’s race will be Marten Van Riel, who will be a man on a mission after bad luck plagued his WTS Grand Final last weekend. First, the Belgian was unseated by a Vincent Luis back wheel early on in the bike section, then his chain dropped heading into T2 having worked so hard to open up a sizeable gap over the pack. That will leave him hungry for success in Weihai, but the Belgian certainly won’t be expecting things to go all his own way. Last year’s top-three here went: Uxio Abuin Ares (ESP), Rodrigo Gonzalez (MEX), Antonio Serrat Seoane (ESP), and all three return to China looking to recreate that success. Abuin is known for his strong finishes to the season, particularly here in Asia, and the Spaniard will again be a threat despite a quiet 2018 by his high standards. Russia’s Dmitry Poyanskiy returns fresh from victory in Karlovy Vary – his second World Cup win of the year – while Norway’s Gustav Iden came out on top in Lausanne a month ago thanks to an incredible run that proved he is currently in some of the best form of his career despite disappointment in the final two WTS races of the season. The Italian duo of Delian Stateff and Davide Uccellari are always capable of producing something special, while Germany’s Jonas Schomburg will be feeling that the time is surely right for him to deliver a podium-worthy performance after a busy 2018. If Great Britain’s latest young prodigy Alex Yee can find himself well positioned on the bike, he has the ability to outrun most of the field and could yet land a top-ten finish, while teammate Sam Dickinsonimpressed on route to a surprise U23 silver on the Gold Coast, and would no doubt love to carry that form over to Weihai this weekend. For the full men’s and women’s line-ups, click here. It is with great pleasure that we return to the beautiful city of Weihai after this coastal city has been hosting successful ITU events since 2010. This year marks the second year Weihai hosts a World Cup event. Triathlon has a great history in Weihai and it is a delight to hold yet another race in the beautiful city. 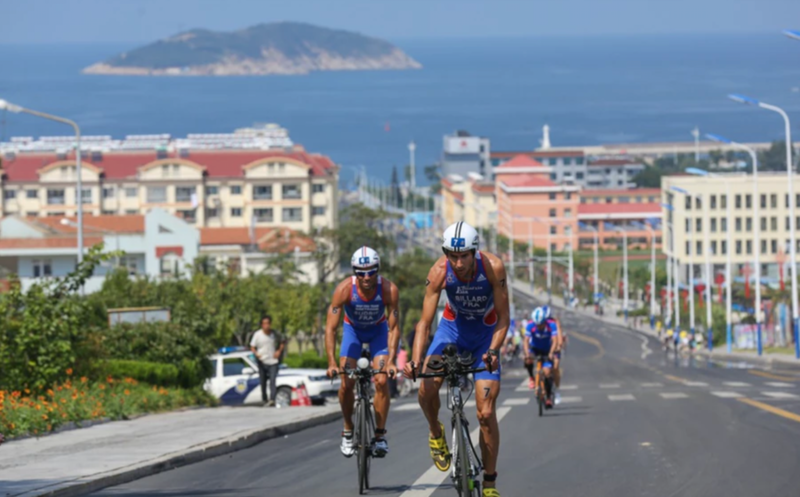 Weihai provides a challenging course, especially for the bike leg that runs along the beautiful seaside roads, providing the athletes with a number of physically demanding hills and corners.